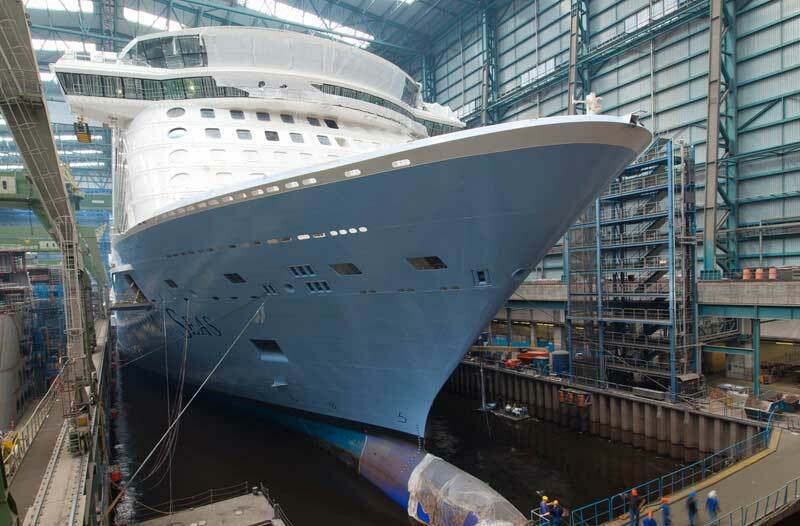 Royal Caribbean upcoming cruise ship Quantum of the Seas has had its float out delayed due to poor weather conditions. The float at the Meyer Weft shipyard in Germnay, Papenburg was supposed to go ahead today (August 9th) but now the shipyard has decided to delay the milestone event until Tuesday August 13th. Once the 167,800 ton vessel is floated out it will be berthed next to the shipyards pier until it begins several tests involving the ships thrusters and stabilisers. In September Quantum of the Seas will then make its way down the river Ems towards the North sea. Many test will be done during this time along with sea trials and propulsion. The ship will be delivered to Royal Caribbean in November 2014. Royal Caribbeans most innovative vessel will then sail its inaugural cruises from Cape Liberty, Beyonne in New Jersey. After that it will reposition to China where it will sail all year round from Shanghai starting from May 2015.